Following my excitement and rather pathetic endeavors to photograph a Cockatoo about 70 feet at the top of a tree with my powerful Nikon zoom lens; we arrived at Hamilton Island to find dozens of them everywhere. Common as sparrows here in Australia, the Cockatoo’s are literally everywhere and brazen with it. They’re a great tourist attraction ‘initially’, but people quickly get fed up with their bad behavior. On the marina front there are cafe’s and restaurants where you can sit and enjoy a drink and something to eat while overlooking the marina. The birds are there in abundance, and not just the Cockatoo’s, but the seagulls and enormous crows, they crowd around the tables hoping for scraps, many of the people (despite notices everywhere not to feed the birds) throw scraps of food, which bring the birds in flocks, screeching and squawking from all directions. If you drop a piece of bread the onslaught is like a scene from Hitchcock’s movie “The Birds”. While sitting at one of the tables, I watched a seagull swoop down and literally steal a french fry from the mouth of a diner. The birds all sit in the surrounding bushes on the rails, cars, umbrellas, anywhere where they can be close to the diners. I was busy taking photographs and had a paper bag on the table with my half eaten feta and spinach pastry in it, I deliberately left it in the bag while taking photographs thinking it would be safe, “ha” not a chance, I turned around at the sound of paper rustling, to see a cockatoo, brazen as brass, on the table with his head in the bag, as I made a grab for the bag he immediately pulled his head out with my pastry in his beak and took off into a maelstrom of screeching feathers as about 50 other birds attempted to steal his catch. Not a great place to sit and eat! 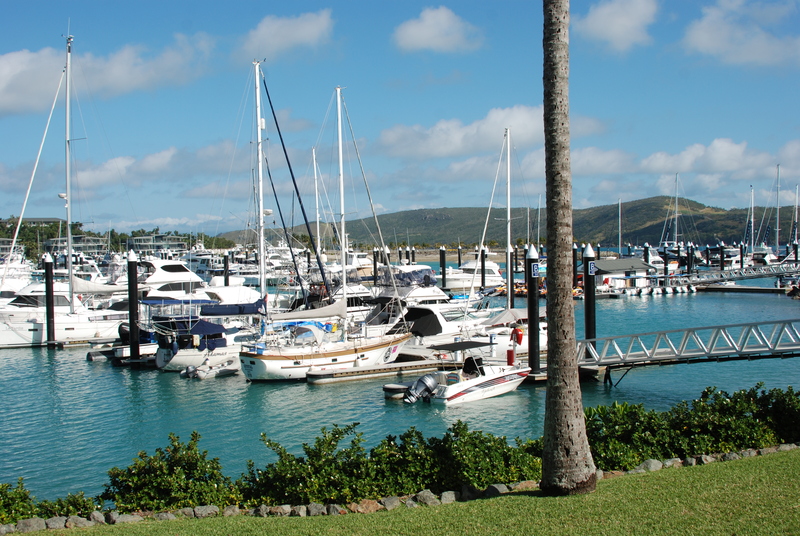 The majority of the Oyster boats gathered in the marina at Hamilton Island, in the Whitsunday’s. Settling in alongside they all raised their Oyster banner’s. Sadly the number of boats in the rally has shrunk quite a bit from the start, as people keep dropping out for various reasons. I know a couple of boats that are staying here in Australia instead of carrying on, another plans to stay in Indonesia; and a few stayed behind in New Zealand (although I can’t blame them, why would anyone wish to leave New Zealand?) So as the rally continues, the numbers decrease. During the first Oyster World Rally we only lost a coupe of boats, I think one was for health reasons and the other, I believe, was because “her indoors” didn’t want to continue on. We also mostly sailed and stayed together, gathering for tremendous party’s at each new stop, there was a real sense of comoradory among the fleet. I wondered upon joining this rally with True Blue, whether this group would have that same sense of togetherness we had on the first rally. Perhaps because the fleet has been so fractured, there hasn’t been the opportunity for bonding. However, happily things seem to be changing. Nigel from ‘Venture’ very generously invited everyone on the rally, (owners, crew and guests) for cocktails and a full sit down dinner, to help him celebrate his 70th birthday. This is the first time I’ve seen the group party together, and actually feel as though they’re a group. 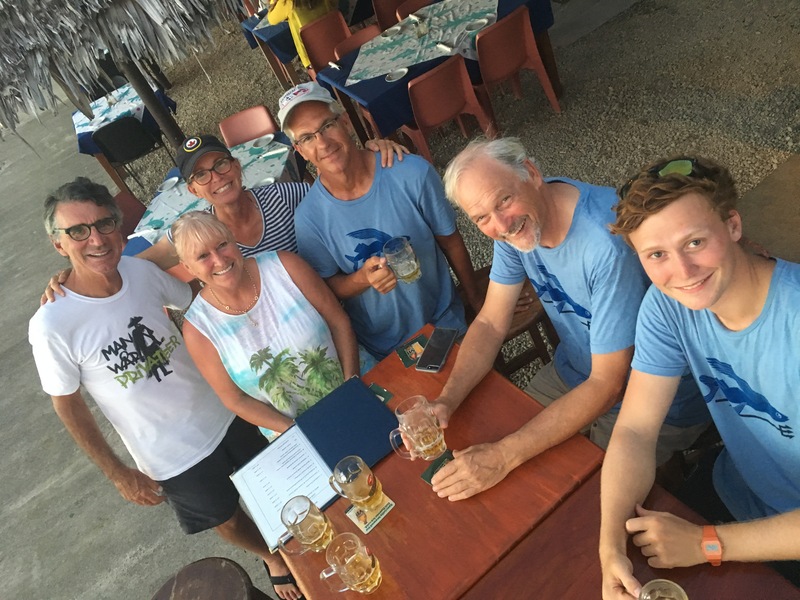 The evening was brilliant, The Manta Ray Cafe laid on delicious food, and there was no limit to alchol, everyone had an enjoyble time helping Nigel celebrate. The next get together was for the hobbycat racing, but that was cancelled due to strong winds, this didn’t stop the group from having fun though as they played volleyball on the beach. 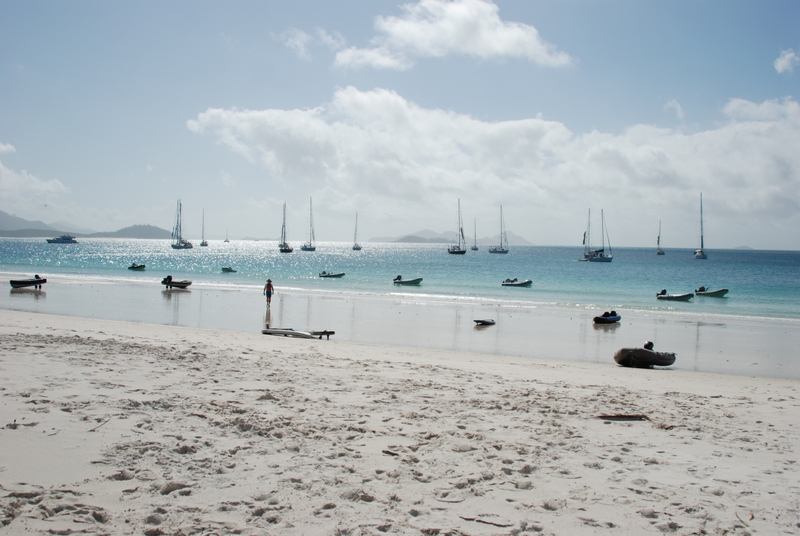 Then just a few days later we all met at the beautiful Whitehaven Beach, for a beach barbeque, that too proved to be a lot of fun with a few boats staying on the beach almost until sunset. I feel very lucky to be part of the second World Rally, even if it is for only part of it. I wondered whether Bob and I would be accepted into the group, but I need not have worried! This is a really nice group of people who seem to have welcomed us with open arms, and I now feel part of a group hell bent on having fun. I’ve never really agreed with keeping wild animals in captivity, although, sadly in the future it may be the only way to ensure the survival of many endangered species. I’m appalled and disgusted by “trophy hunters”, they are vile creatures, who have no respect for our planet or its precious wildlife, no one, even governments seem able to stop them, I fear that will only happen when all the endangered species have been wiped off the earth, then these vile people will have to find other easy targets. Anyone who reads my blog will know I’m a passionate animal lover, I could no more hurt or kill an animal than I could grow wings and fly. It’s the reason I became a vegetarian. I’m beginning to see the value of wildlife sanctuary’s, Parks, zoo’s etc, as long as the animals are well looked after, they will, if nothing else at least ensure the survival of a species. 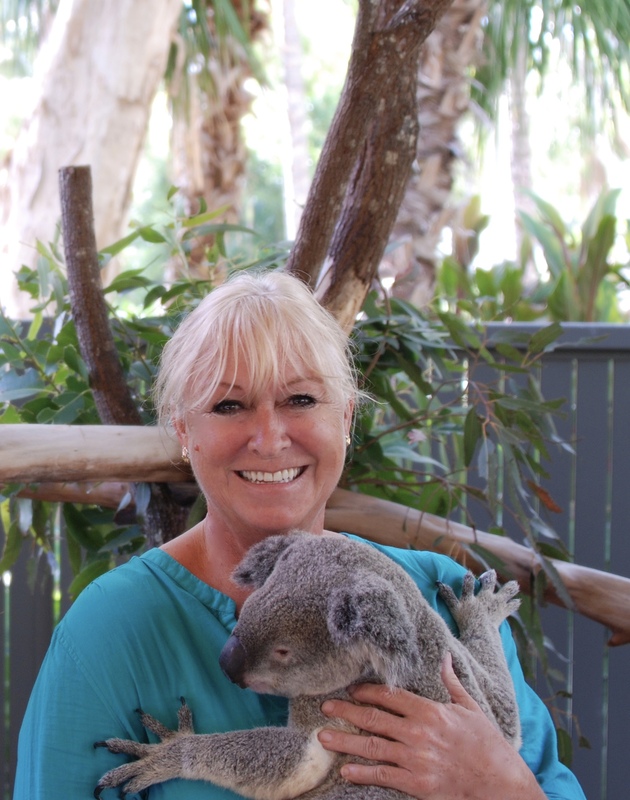 While staying in Hamilton island in the Great Barrier Reef, we visited a wildlife park, where we were able to cuddle with koala bears, truly the most adorable little bears you will ever see. People pay a fee and then line up to have their photographs taken with them. While I waited my turn, I wondered about these little creatures being passed from person to person to have their pictures taken, and I started to feel a little guilty about being there at all. Wasn’t this hypocritical of me supporting this? Obviously I was, by paying to have my picture taken with one! I spoke to one of the staff about it, and they said that the photo sessions were only for 30 minutes, 6 days a week, for the rest of the time the bears were left alone to eat and sleep (which is what they do the most of) and they didn’t appear to mind being cuddled, in face the little koala I held, just snuggled into me and seemed very calm and content. The staff explain clearly how to hold the little creatures, and are right there next to you to ensure no harm comes to them, it was well supervised. Also some of the money goes towards Australian animal conservation, so it’s a good cause. While preparing to write my blog this morning, I scanned back through my posts and discovered that 2017 was missing. How could I do that, miss an entire year? As it was, 2017 was a really busy year for us, we were doing all sorts of traveling and sailing a lot, and I injured my hip dancing and could barely walk for 4 months, and ended up in a wheelchair before finally having a hip replacement in November 2017. Then I managed following surgery to dislocate my hip twice in December, just a few weeks after, because I’m such a clumsy clogs! 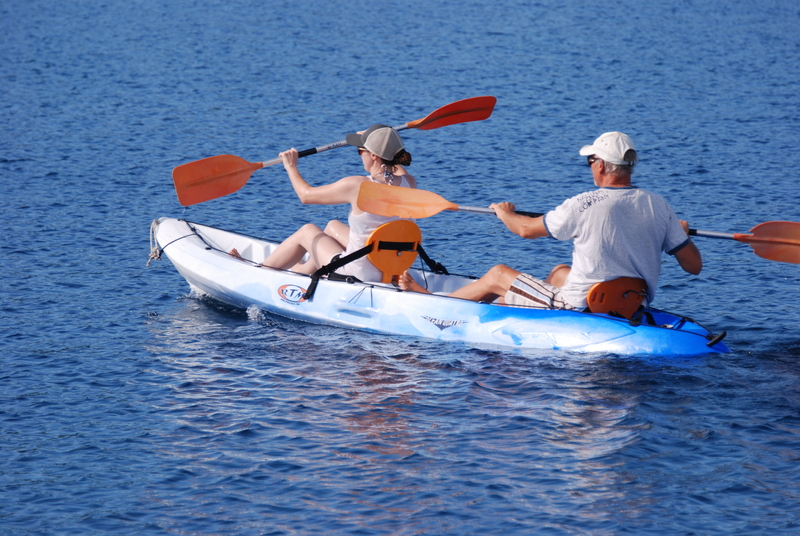 January: On Crazy Daisy in Opua Marina, Bay of Islands, New Zealand, . New Generator fitted. 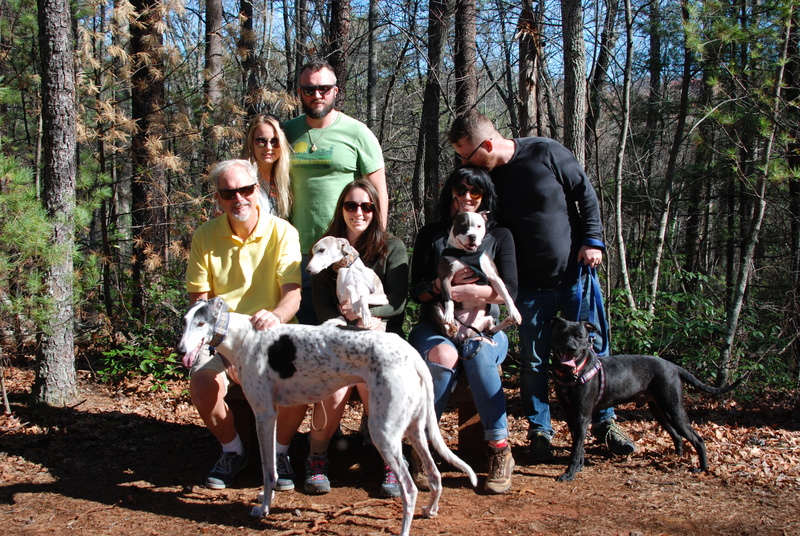 February – April: back in the States with Bob and our children and a vacation in a cabin in the Mountains of North Carolina with all the children and the dogs. Then three weeks in the UK with my Mum. April -May: New Zealand visit to Hobbiton and wine tour of North & South Island with Paul & Trish, touring north end of South island with Bob. May – June: Sail up to Tonga with Paul & Trish, Danni flew out to Tonga to join us on a visit for five weeks. 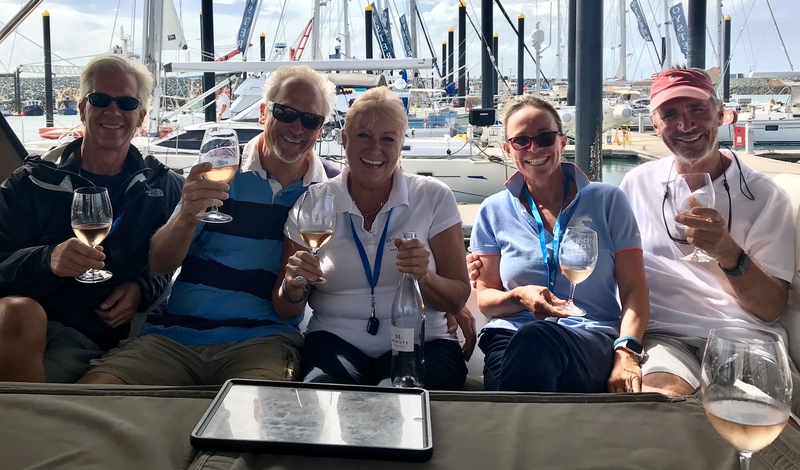 July: Two weeks in Samoa, Wallis & Fiji with Danni, Paul & Trish (hip injury dancing on wedding anniversary) Worst sail ever on the passage from Samoa to Wallis, barely ate for 3 days. August: Fiji, with friends, visited lots of beautiful islands and bays in Fiji, I was unable to walk without sever pain. I did however spend a great deal of time on my jewelry, and Musket Cove Resort now sells my latest collection. September: Fiji, Nic & Sam fly out for a month, Paul & Trish had Lela, Ed & grandchildren out to visit. Swimming with the Manta Rays. 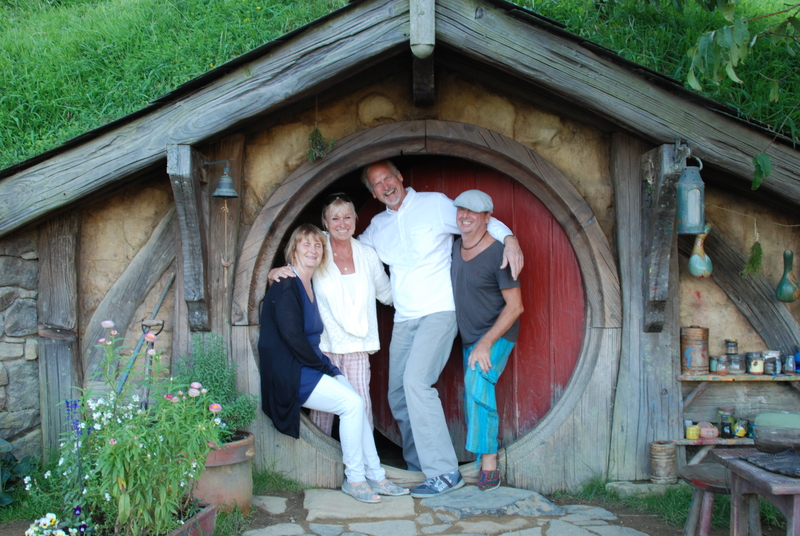 October: I fly back to Auckland to stay with Don & Lesley on True Blue, and see a surgeon about my hip. Bob sails back with crew. We both got New Zealand Drivers License’s, and we bought a car. November: Hip replacement, moved into an apartment in Auckland for two weeks for recovery, then into an apartment in Opua for another two weeks. December: Hip dislocation twice, once on my birthday December 20th… Christmas on True Blue with Lesley and Don. 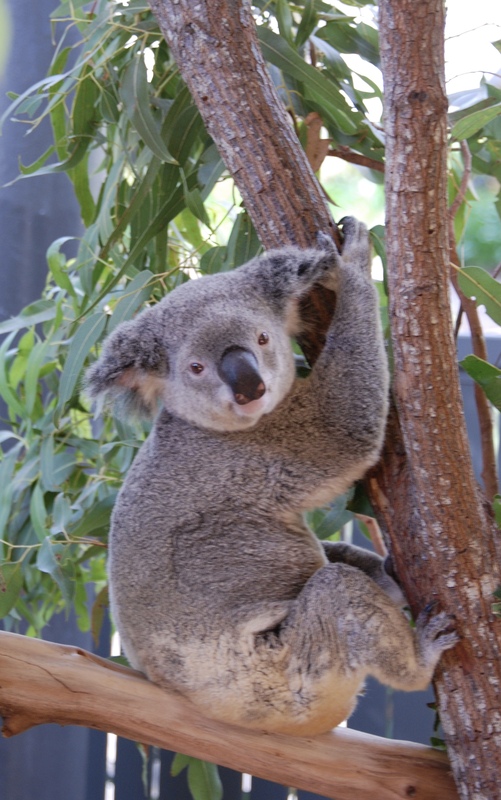 Our next trip out from Mackay started at 5am, as Bob, Glenn and I headed out to Hillsborough National Park to see the Wallaby’s and kangaroo’s on the beach. It was a 90 minute drive and we arrived just after daybreak. Having grabbed a coffee from the cafe we headed down to the beach to see that a small crowd of people had gathered and the wallaby’s and ‘one’ kangaroo were all around. This is a trip really worth doing (especially if you love wild animals and nature as I do), even though it means a really early, before dawn start. 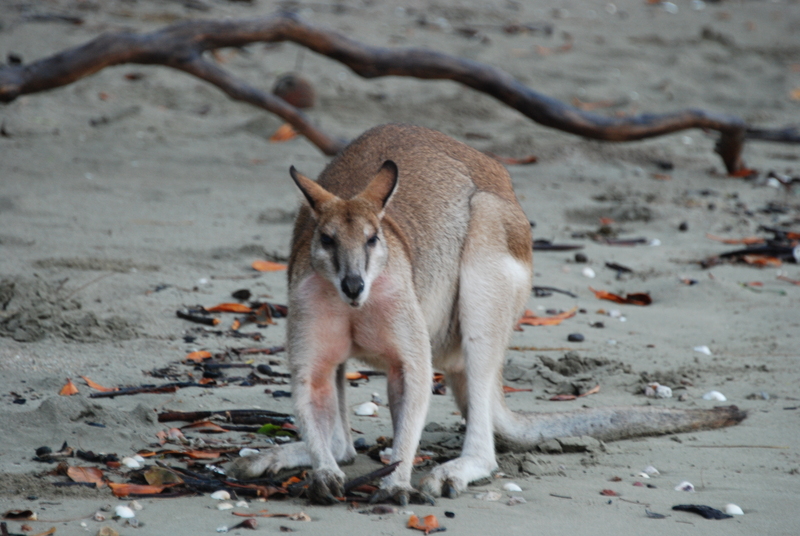 The campsite have a guide who is on the beach to talk about the Wallaby’s and kangaroos who are living in the area. The guide feeds them a special diet of kibble which is served on plastic flat disc’s so they can eat without digesting the sand, they are all quite tame, but you’re not allowed to pet them, they will come right up to you and sniff. 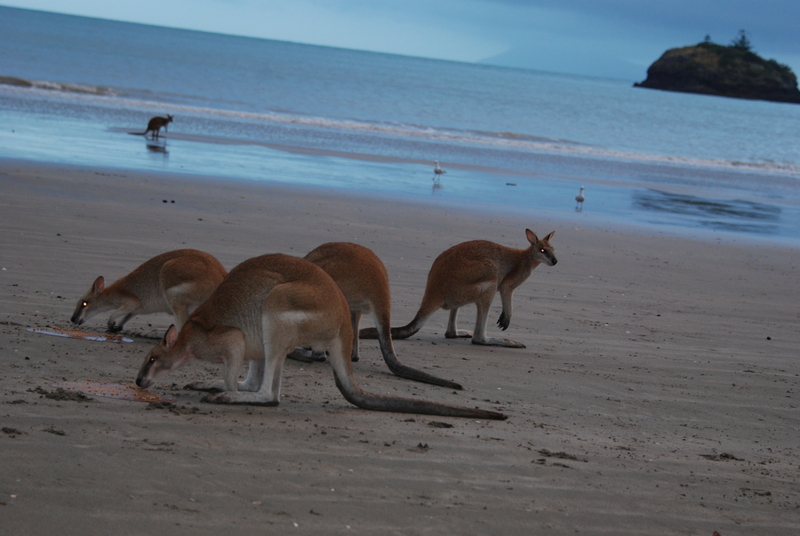 They come down to the beach at dawn every day to feed on the mango pods that wash up there. The campsite quickly realized the potential for tourism and now hundreds of people turn up to see them each morning. We were lucky on our visit, as there was only a small group of people when we were there. We spent about an hour or more on the beach, I even managed to see a Wallaby Mum and her baby. There are organized tours to the site, which vary in price from around $50 – $110 per person, but we simply drove ourselves. There’s no fee to visit the site as it’s a public beach in a National Park. 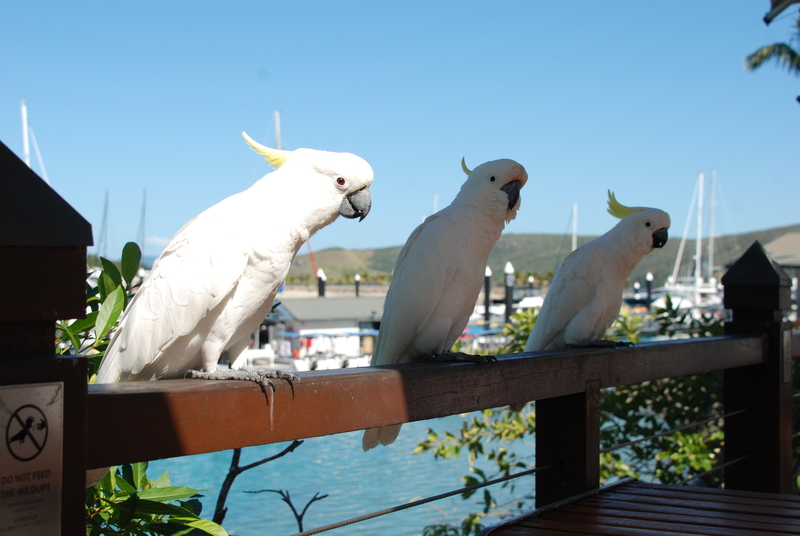 We spent 5 days in Mackay, not exactly a tourist trap, although the marina was quite nice. Tourism here comes a poor second to the sugar and agricultural industries upon which this little place thrives. The main town certainly wasn’t the prettiest place I’ve ever visited, and there’s not much offered in the way of entertainment. However, a couple of things made our stay really worth while. We (we being, me, Bob, Lesley, Glenn & Stuart) took a drive out to Finch Hatton Gorge in the Eungella National Park. (Eungella means “land of Clouds” I had to add this, it sounds so lovely). 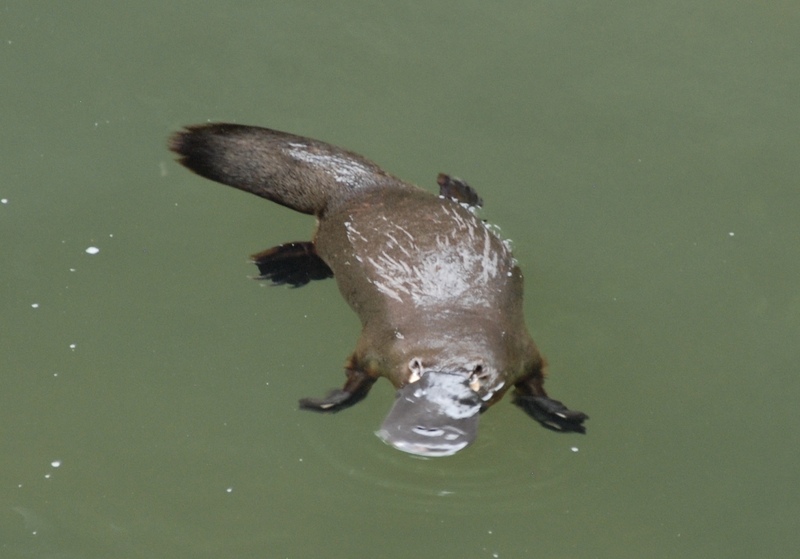 We had read that the park was home to the famous ‘Duckbilled Platypus’, so we decided to check it out. The drive to the park took us past thousands and thousands of hectares of sugar cane, endless, miles and miles of it, we were driving for over an hour past the many plantations. Eventually the sugar ended and we drove on up into the lush, subtropical rainforest, which was fabulous although the typical rainforest weather got us drenched when we got out of the car to take photographs at the lookout. 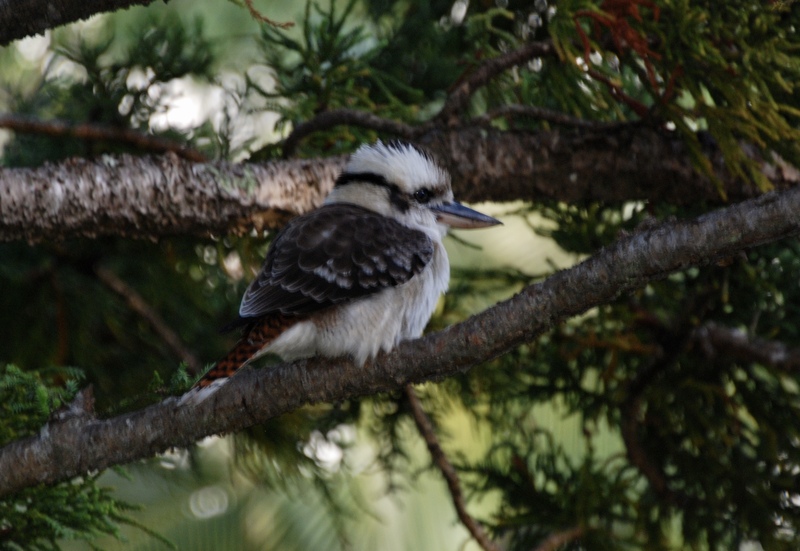 It took us about an hour to reach the park, and much to my delight, as we drove higher up into the mountains towards the National park, we spotted the famous ‘Laughing Kookaburra’, as well as a many other beautiful birds. 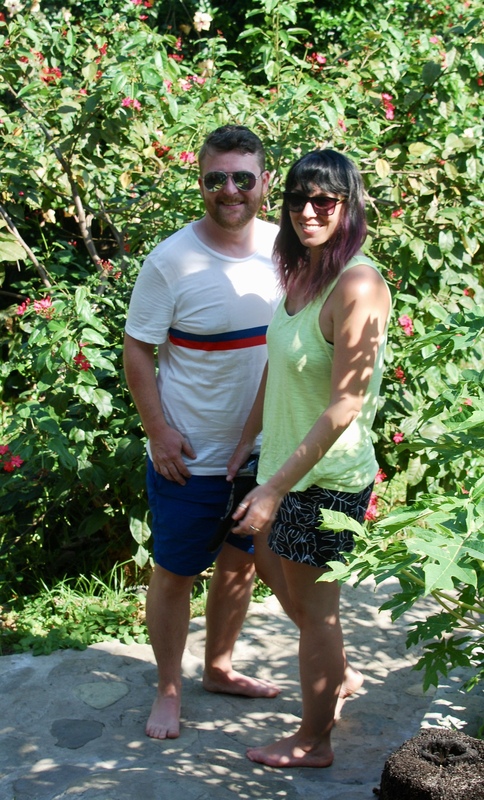 The prehistoric gardens at Finch Hatton Gorge in the rainforest were rich with lush tropical plants, magnificient, ancient gum trees and gorgeous flowers. We stopped for a cup of coffee and a scone at the little cafe, but I’m sorry to say the scone wasn’t actually a scone, rather it was some sort of sponge, not at all what we expected, and my hot chocolate was watery and tasteless, so even though the location was lovely, the food at the cafe was a little bit of a disappointment. The walk along the river was really pretty with turtles, fish butterflies and birds, but no platypus. Just as we were about to give up after having walked up and down the length of it, we finally spotted one. It came up to the surface for air, basked for a few seconds and then dove back down, surfacing again a few minutes later in another spot in the river. We stayed to photograph and watch for about 30 minutes, I also saw a fabulous brightly colored ‘Paradise Kingfisher’. Was it worth the drive and the search? Absolutely. The Duckbilled Platypus are the most unusual, wierdest creatures, and seeing one in the wild in its natural environment was a real treat. Customs, immigration and bio security were due to arrive between 8:30 and 9 this morning. Lesley and I had planned to get up early to sort out the fresh food we had left, that would probably be confiscated. Unfortunately we both slept a little later than normal and I was busy sorting the fridge food at 7:45 when the bio security officer ‘Alan’ turned up. While Don sat and went through all the paperwork with officer Alan, I hastily made Gruyere cheese puffs, using up the last of the puff pastry and the Gruyere cheese. After paperwork, came the inspection of the pantry, fridge’s, freezer and all food storage areas. 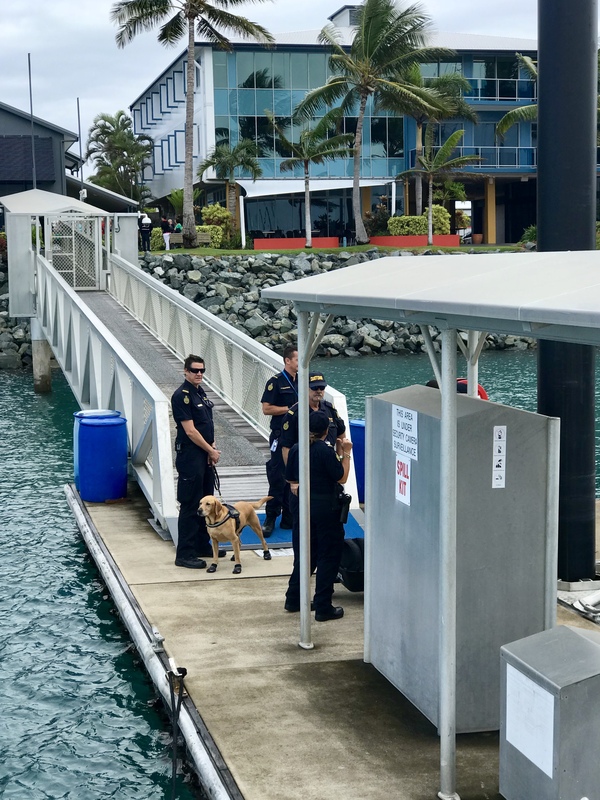 Then the troupe of officers from customs turned up with ‘Hooch’ the adorable detection dog. Hooch was wearing a very sporting set of black uniform booties, to make sure his claws didn’t damage the teak decks. We all has to get off the boat so Hooch could do his job. The officers were all extremely nice and went through the boat with a fine tooth combe, it would have been impossible to hide a toothbrush, they were so through. Australia “on route’ The Journey! I hadn’t let on that I was nervous about doing the passage from Vanuatu to Australia, anyone who reads my blog is well acquainted with my fear of ocean crossings. However, in an effort to be brave, I was determined that I was going to make this trip. Don hadn’t let me make the crossing from New Zealand to Vanuatu, out of concern for my welfare, the chance of dislocating my hip if the going got rough was very real, given my history. As it turned out it was probably the right decision as they had to endure a few days of really rough weather on the crossing. It’s been almost five months since my last dislocation and I’m feeling really good now, I’m still mindful of being careful, the fear of doing it again is still fresh in my mind, not to mention the trauma I inflicted on my closest friends Paul & Trish, if they will ever recover from that traumatizing event is still unknown. There’s also the threat from my surgeon that if I do it again I’m straight back into surgery. Anyway enough about my bloody hip. When we left Vanuatu,( the we being ‘me, Bob, Lesley, Don, Glen & Stuart) we had clear blue skies and friendly seas. The first two days and nights were actually lovely, although I did sleep through much of it, just getting up to help Lesley in the galley. True Blue was rolling a bit although we were flying along between 9 & 10 knots. The third day got a little rough with confused seas and much more rolling around, surprisingly I was able to function really well in the galley, we had the air con on and that really helped, but cooking or doing anything really was quite a challenge as you have to always have one hand holding on to something. Lesley and I stand in the galley in a partial warrior pose (Yoga), in order to balance while we work. I wish Bob had filmed us making meals it would have been quite the comedy to watch later on. Trying to work out how I explain to ‘non sailors’ what it feels like to be in rough seas is hard, as I can’t really imagine anything else like it; the floor is constantly tipping from side to side and occasionally jumping up and down, or as I like to say skipping, because that’s what it feels like to me; in a heartbeat you can go from feeling steady and secure to being thrown up in the air, or catapulted unceremonously in any direction other than which one was planning to go, or not, as the case may be. One very sleepless night in bed, while the boat was doing its very best to tip me out, my imagination flipped into gear (my imagination is like a crazy hamster on a wheel). I imagined that if I was standing on the shoulder of a giant who was striding along swinging his shoulders from side to side as he loped forward, but occasionally tripping, causing me to be violently flung forward if I wasn’t hanging on for dear life, probably sums up the whole experience as best I can. No I’m not talking about the dishes we serve, although despite all odds Lesley and I both come up with incredible meals while underway. I’m referring to the delight’s of preparing those gourmet meals while underway. When the passage is smooth and we have the windows open or the air con running it’s not difficult to work in the galley, but when the conditions are such that you have to hold on for grim death to anything that enables you to remain upright while everything around you is moving, it’s a real challenge. Yesterday it was all too much for Lesley, we were both bouncing around the galley like ping pong balls in an arcade game, so I took over preparing the dinner, as by some miracle, despite the horrible conditions I was OK. I’ve only taken one Dramamine (for seasickness) since I arrived, but that’s mainly because I just forget to take them, and by some miracle I haven’t been seasick once. I’m actually able to function in the galley! I think I may have found my sea-legs at last. However, we were tipping from side to side so much, everything was slipping and sliding around all over the place, I was attempting to cook a vegetable curry with rice and samosa’s for six people. The oven which is (obviously) gimbled, was tipping so much, with two large boiling pots on the top I couldn’t even open the oven and had to call Bob and Stuart to help. Just the effort of standing upright was exhausting. True Blue continues to plow along at 10 knots, and at that speed it makes it even harder to find your balance. Yesterday the galley sink pump stopped working, meaning we couldn’t drain the sink, so Glen and Bob had to take it all apart and fix it, not a fun job with the boat bouncing around and the galley about 100 degrees. Eventually Don put the air con on and that made a big difference. 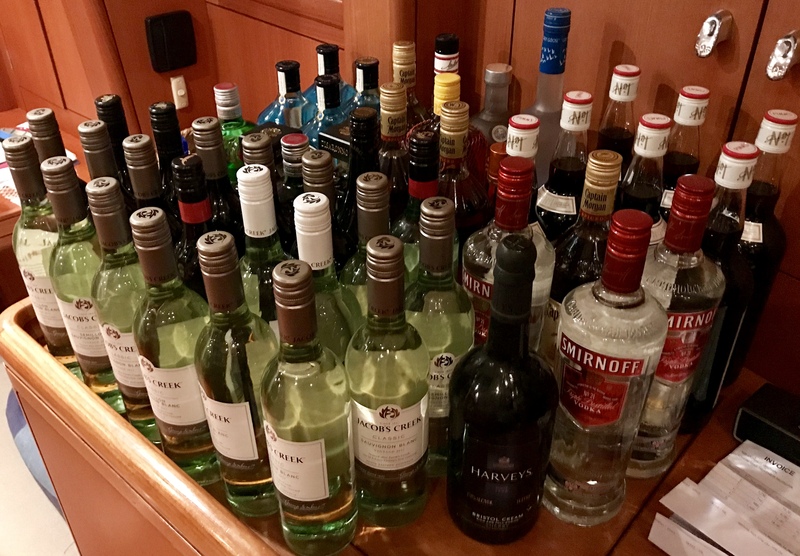 When provisioning in Portvila, I had spent a small fortune on wine and spirits (not that we’ve been drinking much on passage), but it proved a real challenge to find storage space for all of it onboard, consequently Lesley and I were filling every space in every cupboard to get it all stored away. When Don was routing around looking for parts for the sink pump he opened a cupboard and three bottles of wine fell out, one landing smack on his head, producing a large bump, a headache and a bad temper… understandably he was not a happy bunny and came up on deck yelling at me to store the wine properly in the future; I can’t say I blame him, I would have been pretty pissed too. It could be a while before I offer him wine with his dinner!